If you love history, you'll appreciate visiting a city that's not only lined with Victorian mansions and priceless World War I and II memorabilia, but also played a pivotal role in the civil rights movement. There's also beautiful scenery and heart-stopping motor sports action to please adrenaline junkies. In other words, Topeka vacation packages will appeal to all! You'll be on vacation, but you'll be smart to go back to school while in Topeka. Specifically, make sure to visit the once segregated Monroe Elementary School. Now the site of the Brown v. Board of Education National Historic Site, it offers a fascinating glimpse into the civil rights struggles of the 1950s and 1960s. You'll also be smart to look into Topeka rental cars, as traffic is usually light, and parking is plentiful here. Why not enjoy the convenience of your own transportation? Other historical sites to visit include the circa-1866 state capital building (which completed an extensive remodel in 2013), Combat Air Museum, Kansas Museum of History, and the eclectic Museum of the Kansas National Guard, featuring a life-sized replica of Hawkeye's tent from the TV show MASH! For an adrenaline rush, head to Heartland Park Topeka to watch the dragsters race down the quarter-mile strip. For both the young and young at heart, Kids Stampede at Old Prairie Town is packed with fun on the Saturday before Memorial Day. Also held here is the Apple Festival during the first weekend in October. Gorge on all things apple and enjoy a fun festival atmosphere. Music lovers should head to the Spirit of Kansas Blues Festival on July 4th. Have a taste ethnic cuisine? Fiesta Mexicana in July and the annual Inter-Tribal Pow Wow in August or September can't be beat. Inspired to book your vacation in Topeka? You could try clicking the heels of your red shoes three times. But if that doesn't work, check out Travelocity's money-saving vacation packages to Topeka. Book airfare and hotels in Topeka at the same time and save a bundle! The gem of Lawrence is arguably the University of Kansas and its castle-like silhouette. Those who embark on Lawrence vacations to check out the school will soon realize there's much more to this vibrant, picturesque city. Potential coeds and those simply looking to experience America's heartland are wise to look into Lawrence vacation packages and prepare to be amazed by nature, history, and a wholesome, good time. Situated in Topeka, this hotel is 0.9 mi (1.4 km) from Kansas Museum of History and within 3 mi (5 km) of Gage Park and Topeka Zoological Park. Mulvane Art Museum and Ward Meade Park are also within 6 mi (10 km). 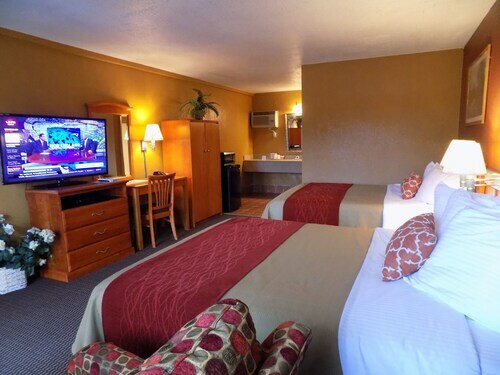 Situated in Lawrence, this hotel is within 3 mi (5 km) of Haskell Indian Nations University, Watkins Community Museum of History, and University of Kansas Natural History Museum. Lawrence Arts Center and Spencer Museum of Art are also within 3 mi (5 km). Situated in the entertainment district, this hotel is within 3 mi (5 km) of Kansas Museum of History, Gage Park, and Topeka Zoological Park. Mulvane Art Museum and Washburn University are also within 6 mi (10 km). 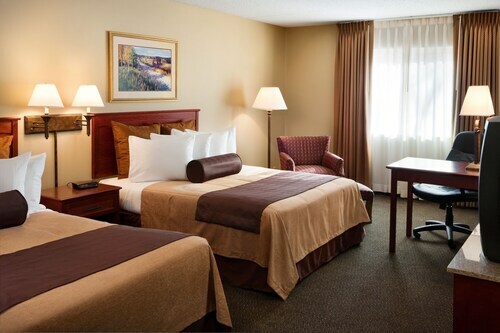 Situated in Lawrence, this hotel is 0.1 mi (0.1 km) from Rock Chalk Park and within 6 mi (10 km) of Lied Center of Kansas and University of Kansas. Lawrence Outdoor Aquatic Center and Allen Fieldhouse are also within 6 mi (10 km). Situated in Topeka, this hotel is within 1 mi (2 km) of First Presbyterian Church Topeka, Kansas State Capitol, and Brown v. Board of Education National Historic Site. Ward Meade Park and Washburn University are also within 3 mi (5 km). Topeka Station is 6 minutes by foot. 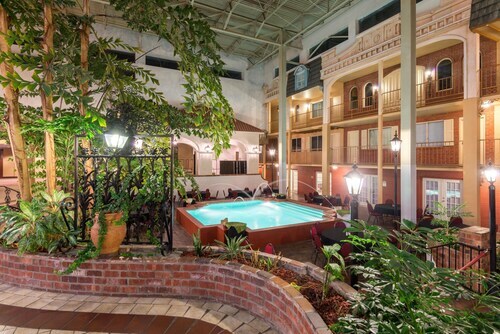 Situated in Lawrence, this hotel is 1.4 mi (2.2 km) from Old West Lawrence and 1.7 mi (2.7 km) from University of Kansas. Robert J. Dole Institute of Politics and Lied Center of Kansas are also within 2 mi (3 km). Located in the heart of Lawrence, this motel is 1.5 mi (2.4 km) from Old West Lawrence and 1.8 mi (2.9 km) from University of Kansas. Robert J. Dole Institute of Politics and Lied Center of Kansas are also within 2 mi (3 km). 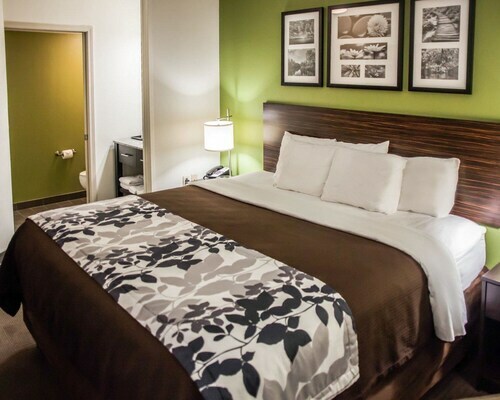 Situated in the business district, this hotel is within 3 mi (5 km) of Kansas Museum of History, Gage Park, and Topeka Zoological Park. Mulvane Art Museum and Washburn University are also within 6 mi (10 km).